Baby Wesley is here! And, I finally have an opportunity to write this blog post. I’m writing this from my phone on the couch after his late midnight feeding and Wesley is 10 weeks old today. It’s my last day of maternity leave..which makes me so sad. But, let me tell you, it’s been super hard in between the really good days. Which this has been hard for me to admit because I just want this happy go-lucky newborn time and instead I have had anxiety, crying and a test of my patience. They’re not negative feelings I have every single day, but they have definitely become more present than before and it’s been a challenge to navigate that, especially in the beginning. Learning so much, so quickly about how to take care of a newborn has been such a jump of what I expected vs. reality. It’s amazing that I turned 30 AND gave birth to my son at the same time, so it really feels like a heavy page has been turned in my story. It’s really funny telling stories of my past and thinking how silly it was or so carefree! Now, I really do feel such a difference on how to approach the world and even a difference in how I view mothers conquering life! Everything that happened Pre-Wes is done and already feels so different. So much less responsibility and flexibility that I don’t have anymore, for now. And, at the same time, there are so many things I can’t wait to repeat and show him. The ocean, tall cacti, National Parks, dandelions, hot air balloons, lightning in the distance..so much. I can’t wait to drink coffee with him, bake Mexican wedding cookies with him, paint with him, show him all of my favorite films, dance with him, photograph him, go to museums with him and of course, go to Disneyland together (multiple times) to watch his eyes light up through his imagination. This all flashes through my mind and heart sitting here in the dark waiting for his reflux to settle by sitting upright on the couch..it’s the little things that make these sleepless nights worth it. It’s my reminder when he’s screaming crying through his diaper changes. And, it especially flashes forward when he smiles at me. His smiles fill me up with so much gratitude that I could explode. Motherhood has been rough in adjusting to sleep and figuring out Wesley’s reflux, which no one can prepare you for when he’s seemingly gasping for air and spitting up through his nose..There have been some hard nights. But, the good times do outweigh it all and any moment with him is my favorite part of my day. He’s just the cutest boy of all time! I’ve explained to my closest friends and family that it doesn’t even feel like I’m a “mom” yet. I’m just a caretaker that is keeping this baby as happy, healthy and clean as possible. I know that feeling will change and progress over time, and as I keep hearing from other moms, “it gets easier”..so I do hold on to that. We have our really good days with the bad. And, despite the exhausted feelings, I’m so happy Wesley is here and all mine. The amount of things he teaches me every single day..all the patience, gratitude and love..I could go on and on. 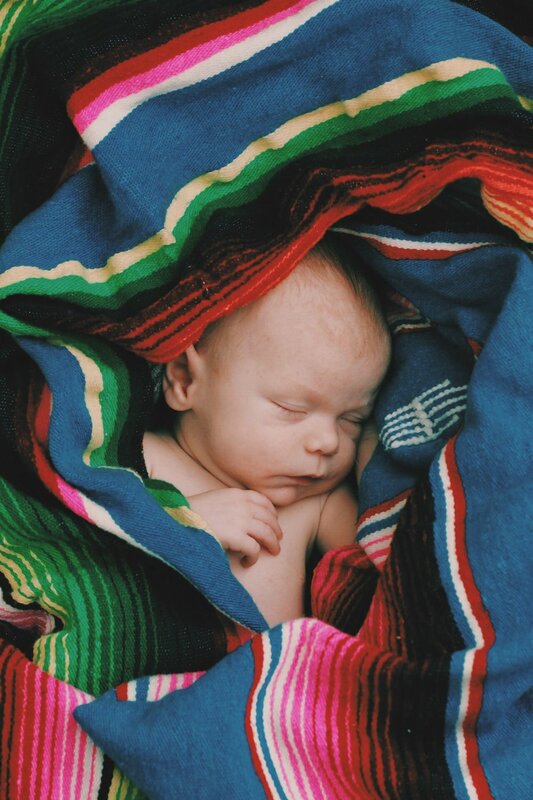 I took these photos to complete the circle of our little Mexican blanket enveloping the different stages of life. First during our engagement photos with Norina, then we stood on it during our wedding ceremony while exchanging vows, used it for my maternity photos with Prince and finally wrapped around our first born, Wesley Marcelo Christie. I can’t repeat enough how grateful I am to have little Wesley as my son and I am already so proud of him. So proud to be his mother. My forever love. I can’t wait to continue and share our stories together.